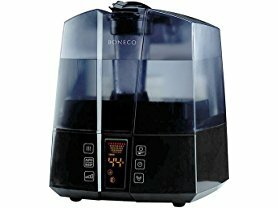 Today only this Boneco Warm/Cool Mist Ultrasonic Humidifier is just $119.99 (Reg. $199)! This Digital Ultrasonic humidifier uses high-frequency vibrations to generate a micro-fine mist when blown into a room immediately evaporates. Choose the pre-heating function and mist exits the appliance at a pleasant 104 °F. Auto Mist Technology (AUTO Mode) monitors the temperature and automatically adjusts the output when conditions change. A replaceable demineralization cartridge ensures a water mist without lime scale or mineral residues. The included Hydro Cell provides constant freshness in your humidifier.